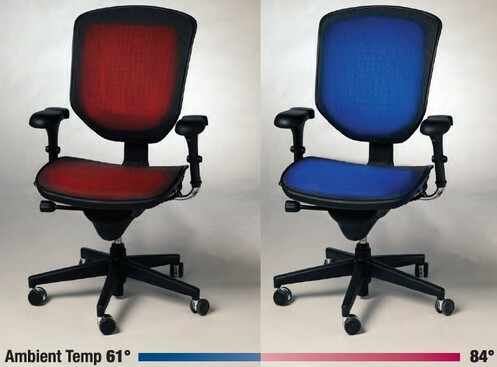 Everyone In The Office Can Be Happy With This Thermoregulated Chair | OhGizmo! Everyone has a slightly different internal thermostat. Your author happens to be constantly overheating, only happy when the ambient temperature is glacial. This of course makes for heated (get the pun?) arguments around the office thermostat, since most other people are normal. We should get the Tempronics heated and cooled office chairs. It features a cooling and heating system that allows each individual user to set his preferred working temperature. In tests, the chairs were able to keep workers comfortable between 61F (16C) and 84F (29C). It uses around 75W of power to do its thing, and the company is billing it as a way to save on energy costs as a typical AC can consume 1,800. We’re not sure the math works out here, since it would just take 23 of these chairs to be 1,800W. Then again, maybe an 1,800W AC isn’t enough to cover the area taken up by 23 workers, so we’re not sure. Any uh… experts on this field in the audience? Not that it matters, but we’re curious. Anyway, the chairs cost between $800 and $1,100 depending on quality. An 1,800W A/C unit is pretty small. An average size a/c unit (36,000 BTUs) uses about 3,000W. However give then cost of 23 chairs you could by a few a/c units.